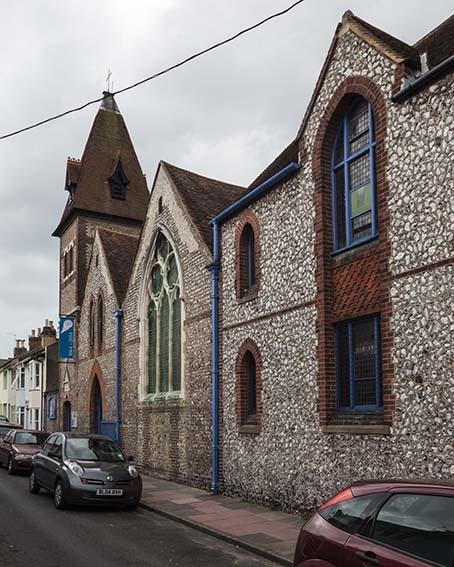 The cramped streets south and west of Elm Grove are named after Protestant and Liberal heroes such as Luther, Carlyle, Lincoln, Washington, so it is ironic that one of the most ritualist churches in Brighton, remarkable for its glass and fittings (see below), is here. It was built in 1864 by A D Wagner as a mission church, with plain, whitewashed walls and unpainted timbers. The architect was W Dancy, a Brighton surveyor (Maughan p43) of whom little is known. The similarity with Bodley’s demolished St Mary Magdalene, another Wagner mission church, has been noted (e g by Dale p122) and Dancy probably used this as a model, though the sloping site allowed classrooms to be placed under the west end. 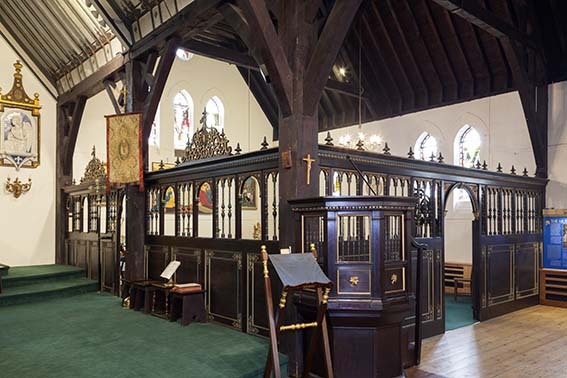 Because of the fall in the land and the need for entry from the street, the orientation of the church is reversed, with the altar at its western end (references here to ‘west’ etc should be understood in their liturgical sense). The congregation grew and by 1881 Wagner wished to build a larger church, as he had done at St Bartholomew, but they preferred to keep the old one, which was extended instead to designs by E E Scott and R S Hyde (B 40 p526). By the completion of work later in 1881 (B 41 p284), Scott was sole architect. He probably rebuilt most of the church, though only the north aisle was wholly new. Flint-built, it has plain lancets except for the east window of the new aisle which has Decorated tracery. 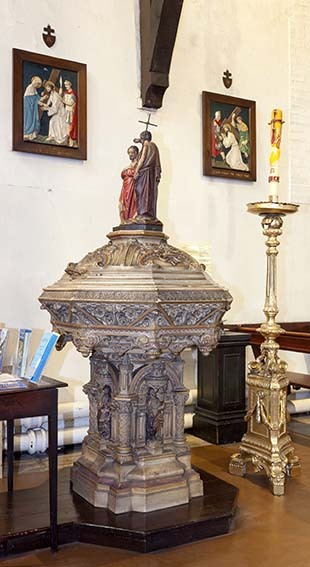 This was re-used from the parish church of St Nicholas, where it dated from R C Carpenter‘s restoration and had recently been replaced by a larger one. The interior has two rows of wooden posts with struts, supporting the roofs. These impressed Pevsner, who commented that it was ‘almost like a New Zealand pioneers’ church’ (BE p430, not fully repeated in BE(E)). 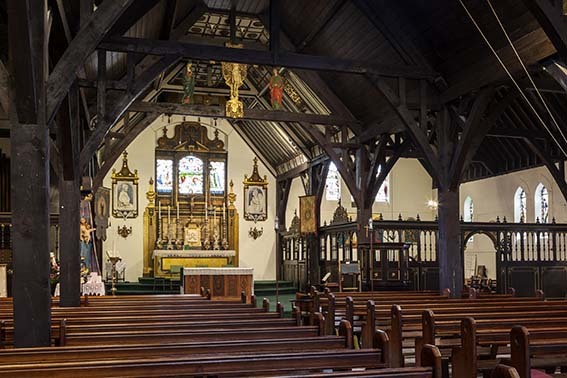 By a curious co-incidence of which Pevsner cannot have been aware, a pupil of Scott at an earlier date, F de Jersey Clere, emigrated to New Zealand, where he became a church architect (see his BAL Biog file). Even if Dancy designed the original, the present effect is Scott’s and fittingly in the case of a Sussex architect, Maughan suggests the timberwork of the mediaeval hospital of St Mary, Chichester as a model (p45). 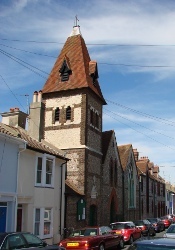 Scott’s final partner and successor, F T Cawthorn, added the tower at the southern end of the street side in 1892 (ibid) It serves also as an entrance and its squat, tiled spire contains small bell-openings resembling lucarnes. Font: Described as French of c1870 (Antram and Morrice p189). It is elaborately decorated and made of wood and terra cotta with a top, surmounted by the Baptism of Christ. 1. 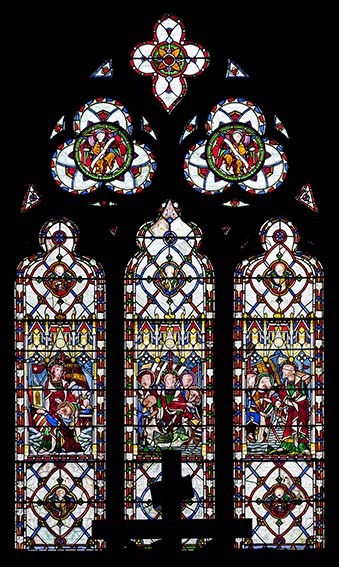 (West window) This contains glass by J R Clayton (see under Clayton and Bell), 1853 (before he had met Bell) and like the tracery, comes from St Nicholas (Antram and Morrice p16). 2. (Window behind the high altar) Morris and Co, 1866 (Sewter p32). 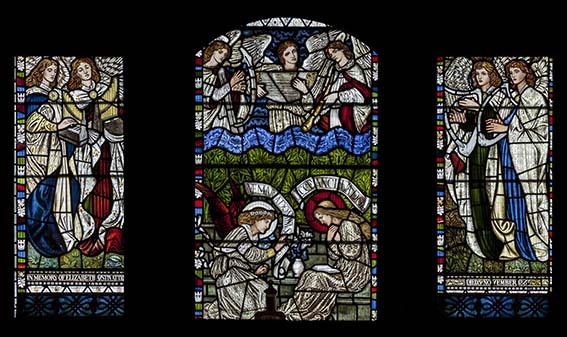 The central Annunciation is by D G Rossetti and the sides with angels by Sir E Burne-Jones (Maughan p47). The light figures and predominantly dark green background, with a contrasting bar of blue across the centre, create one of the finest of the firm’s earlier windows. 3. 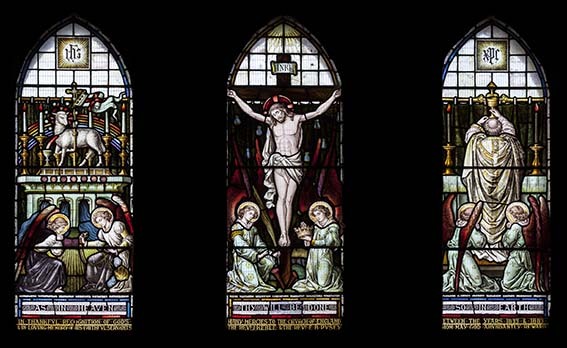 (East, north and south windows, including east roundel) Heaton, Butler and Bayne, 1884 (B 46 p717). Figures of the Apostles against a background of grisaille glass in the side windows and an Adoration of the Lamb in the east window. 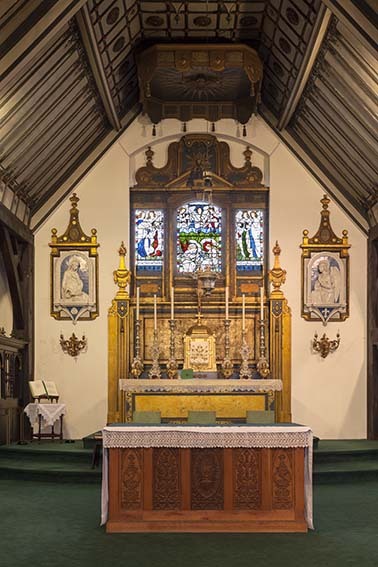 Reredos: Together with other fittings, this was designed in the Italian style by M Travers, c1925 (Warrener and Yelton p321). It is designed to reveal the glass in the window behind. The flanking Italian della Robbia plaques are contained in frames which were also by Travers (Cocke p31). Screen: M Travers, c1930 (EH), replacing one by E E Scott, 1881 (B 41 ibid).